It’s noteworthy that the North-South and East-West Superhighway schemes, which (while not perfect by any means) are the most ambitious and inclusive designs for cycling currently on the table in Britain, barely use any Advanced Stop Lines (ASLs) on the length of their route. The Superhighways are good because they do not use ASLs, among other reasons. Indeed, more generally, good cycling schemes don’t involve ASLs. That’s because ASLs are lipstick on a pig. They are a tokenistic attempt to provide something a bit ‘cycle-friendly’, a veneer of legitimacy, while doing next to nothing to address objective problems of safety (and, as we shall see, often creating problems of safety), or to create an environment that feels safe and comfortable to cycle in. Good cycling schemes separate cycling, temporally and/or spatially, at major junctions, or they involve lowering motor traffic levels to a point at which ASLs are redundant. 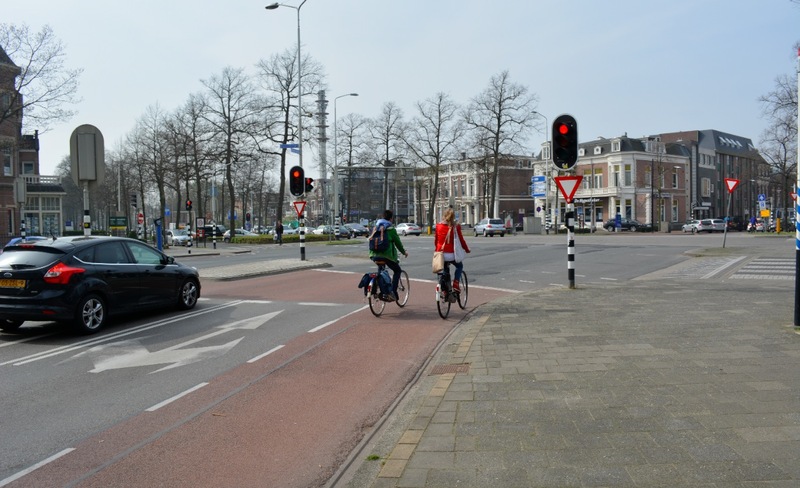 The reason why ASLs are disappearing from the Netherlands is that the maximum motor traffic threshold for their use is roughly equivalent to the point at which traffic signals can, and should, be removed. That is – Dutch guidance only recommends using ASLs at a level at which traffic signals shouldn’t even be being used. The other set was at either end of a new Fietsstraat in Utrecht. It’s questionable whether they are even needed. Does this ASL need to be here? And if it does need to be here, shouldn’t that suggest a wider problem with motor traffic levels? Or through junctions where signals were required, and cycling was separated from motor traffic. Advanced Stop Lines are almost entirely absent in the Netherlands because they are a deeply mediocre approach; an attempt to accommodate cycling in an existing motor-centric template. Why are they so dire? Even if Advanced Stop Lines do work, they only do so on a part-time basis. When traffic signals are green, they offer absolutely no benefit at all – they’re just a large painted area on the ground. There’s no point them even being there. When traffic signals are red, anyone who doesn’t want to find themselves in a potentially dangerous situation has to run through a complex assessment process, adjudicating the risk of attempting to reach the ASL. This flowchart from Magnatom summarises this process brilliantly. The problem is that human beings are fallible, and they will make poor decisions and mistakes about whether to attempt to reach the ASL, or to wait safely. Impatience can’t be designed out of us; we will always want to make progress. ASLs represent a very poor way of attempting to deal with that human fallibility, especially as they may encourage poor decision-making, and do nothing to prevent dangerous outcomes. 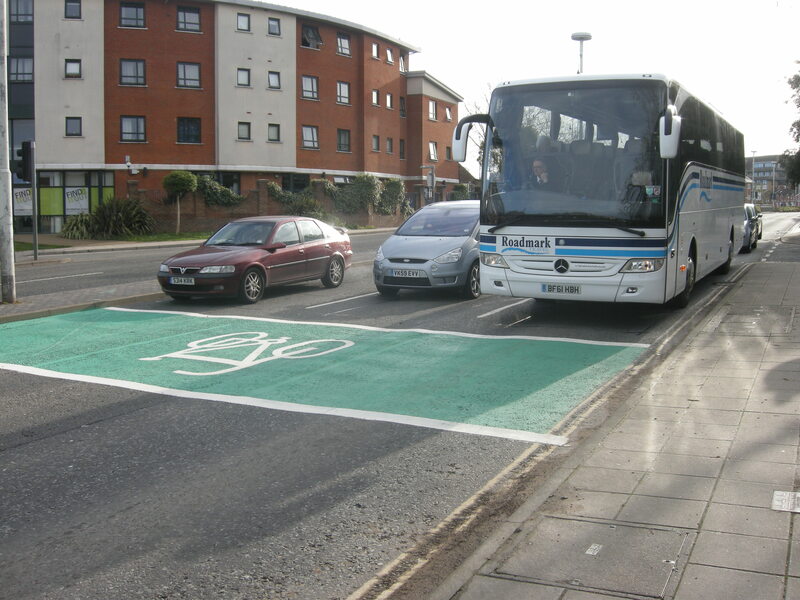 The thunderous main roads in Horsham have recently received some tokenistic green paint at three major junctions. Many of these ASLs are often difficult (or even impossible) to access. Even when these ASLs are apparently accessible, considerable danger is presented, as in this instance, from just the other day. 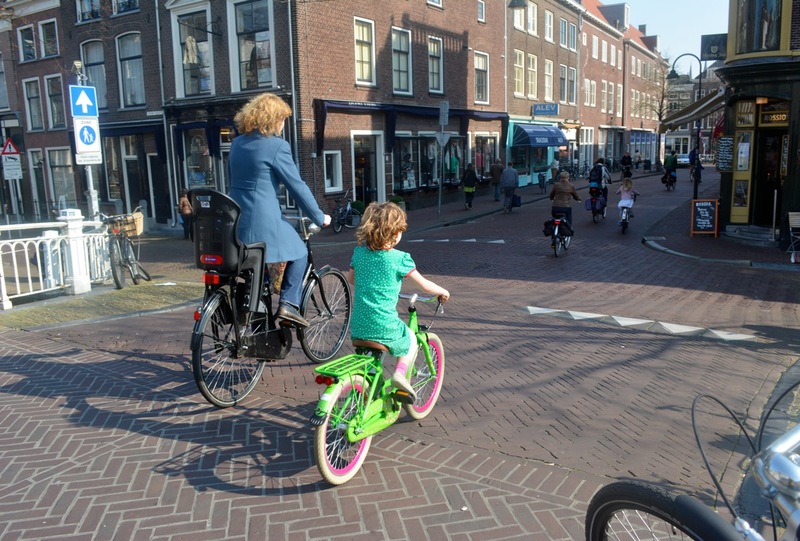 Note here that I have highlighted a young child on a bike, completely ignoring this new ‘infrastructure’, and cycling on the pavement – entirely sensibly. These ASLs have done nothing to ameliorate the hostility of these roads; even for those people who evidently want to cycle, like this young boy. 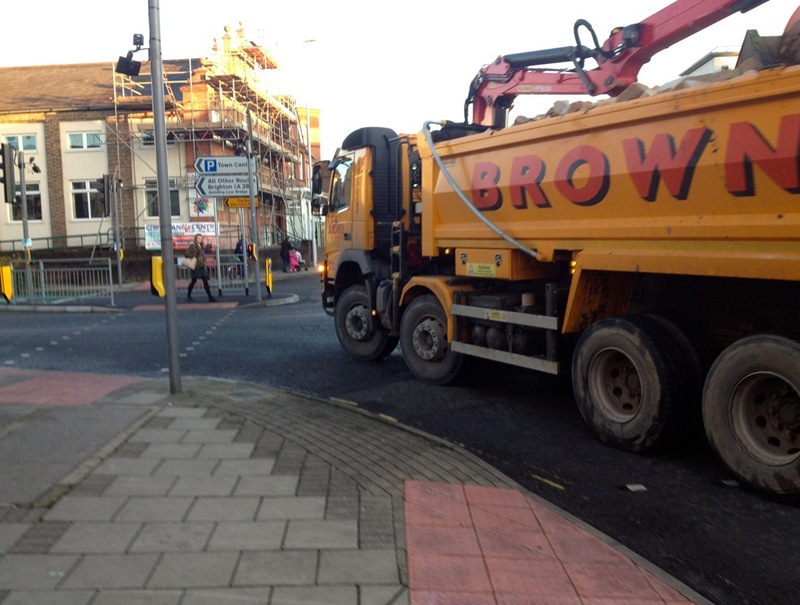 An HGV is waiting at a red light, and a nice tempting ASL is within easy reach. But (because I am reasonably clued up about these matters) I know of the lethal danger posed by this kind of situation; I don’t know where the truck is going (it isn’t signalling, at this point, and even that shouldn’t be relied upon) and I also don’t know how long the lights have been red, and thus how long that truck is going to remain stationary. So I hang back. As it happens, only a matter of seconds later – barely enough time for me to get on the footway and photograph what happens – the truck sets off, turning left, the driver signalling now, as he turns. That is – if you want to stay alive, or avoid serious injury, do not do what the paint is telling you to do. 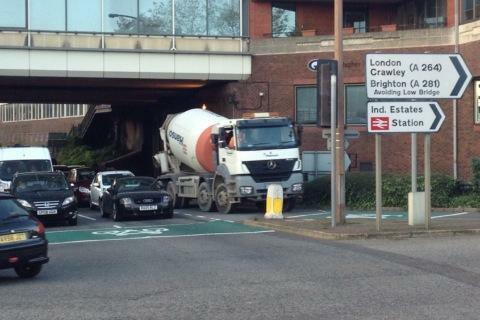 What kind of ‘cycle provision’ is that? Unfortunately there isn’t a great deal else, beyond ASLs, in the toolkit for designing for cycling at junctions. Our current guidance is woefully short on genuinely safe infrastructure at major junctions, and steps are only just being made to address this serious oversight. So it’s partly understandable why ASLs are still being painted out. But their continued presence in manuals, and in new schemes, affords highway engineers, planners and (in particular) politicians a degree of complacency; it allows them to to avoid thinking about the ways in which cycling should be designed for at junctions, and to continue ignoring the serious safety problems, both objective and subjective, that these junctions present. Not the least bit ‘cycle-friendly’, despite the copious amounts of green paint. ASLs are an easy and obvious option, when you want to pretend you’re doing something tangible. So stripping out the ASL from the toolkit – halting the march of the Advanced Stop Line – might just force us to think a bit more carefully about how to design properly at the kinds of junction pictured above, rather than adding in those green boxes and hoping for the best. We need to be forced to think about alternatives. That first Horsham picture of an ASL is the safest of the lot. 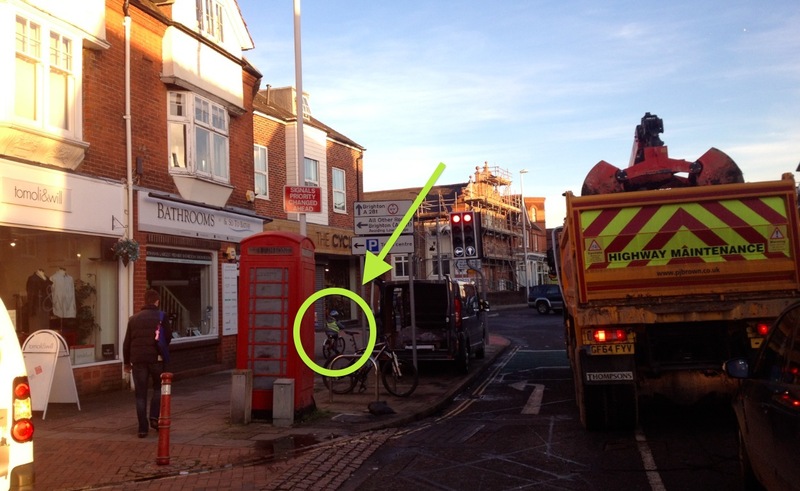 When lights are green a cyclist continues through the junction. When lights are red it is illegal to cross a solid white line, so a cyclist would be breaking the law by entering the ASL. That ASL really is just paint. ASLs painted legally, with a broken line allowing access up the inside of vehicles, are nothing more than sirens luring cyclists to their deaths. I could be wrong but I’m fairly sure the first solid line applies only to motor vehicles, no? It’s even stated in the highway code they can ignore it if they don’t have time to stop, but they can’t cross that line if the light’s already red. Regardless, theyt *have* to stop at the second line. I’m just amazed this whole article was completed without mention of a single ASL violation by a motorist; even if ASLs were a good strategy, in practice I see them get ignored every single day. Another thing about ASLs is when you do filter through, drivers sometimes don’t like the idea you’ve pushed to the front of their queue. I’ve been, the only way to describe it is attacked, by drivers who seem annoyed that I choose to ride to the front and they pass deliberately close to intimidate me. One guy was so close I smacked his window, he was inches from me! It’s really frightening how drivers will use their vehicles like this. All because the infra is designed in a way that if you use it, it will not only put you in many possible compromising and dangerous situations, when you do use it successfully it makes you a target for pushing in! All the junctions with these stupid painted filters should have completely segregated sections for bikes, I just wish there was some way to take the designers to court and have them charged with something along the lines of neglecting the safety of cyclists and even deliberately putting them in harms way. It’s is after all their fault! Yes, drivers do resent ‘queue jumping cyclists’ -but not half as much as they resent a cyclist who doesn’t filter, stays in the queue, and then holds everyone up as the traffic starts to move. Overall, ‘everyone’ benefits when cyclists filter -as long as it is safe to do so. The UK problem is that ‘everyone’ isn’t everyone because conditions exclude kids, beginners and all those who don’t cycle because of the scary traffic. Oh well. This is completely not my experience although I do accept that I can usually out-accelerate cars up to 12mph or so, which some people might have a problem doing. As I wrote in another comment, ASLs are pretty much afterthought provision that benefits the fit-and-brave and I wouldn’t mourn if they all vanished tomorrow. what is it with these drivers who do not start signalling until the light goes green? Are they cheapskates trying to reduce wear on their indicator bulbs? They’re very dangerous as cyclists can be lured up alongside them or trying to get into the ASZ. Before I was even a cyclist, I realised that drivers (if they indicate at all) only indicate for the benefit of other drivers. Other cars can’t pass them while they’re sat at the lights, so why indicate your intention? Why indicate turning in to a side road when there are only pedestrians approaching the side-road around? And of course, the indicate-while-turning. Yes, thanks. I can see you’re turning. What I really needed was to know about 5 seconds ago that you would be turning. It probably isn’t practical to enforce it, I can’t see it ever happening, and as the post suggests it wouldn’t solve the problem (you shouldn’t trust indicators either way), but I am still gobsmacked that there’s no legal requirement to indicate in a timely manner (or indeed, to indicate at all). So dangerous. I should clarify that I don’t think the bike/filter lanes make ASLs okay. But what are you going to do, just stop in the middle of the cycle lane (and blocking it for others)? In dense traffic as you’re nearing the junction it’s already too late to get into primary. If your sitting in a queue of traffic having the car in front indicating can be quite annoying, depending on light level/eye level etc. There I think most motorists turn them off to be polite to other motorists. However as a cyclist it is critical that people indicate there movements even when stationairy so you know wether it is safe to pass. I’d agree with the “lipstick on a pig” overall assessment and left-side advisory lead-in lanes are lethally bad – if it’s not wide enough for a mandatory lead-in lane, then it’s not wide enough for most people to reach the Advanced Stop Line safely and some traffic should be rerouted… but current UK road design loves extra lanes so they can fit more motor vehicles into each queue and values cyclists as 0.2 of a single-occupancy car. But I also think magnatom exaggerates the decision-making process. You overtake the traffic if there’s room and if the lights change before you reach the ASL, then you merge into the gaps in the accelerating traffic. Before ASLs, when I was younger, I used to wait next to a gap a couple of cars back in the queue and do the same trick. 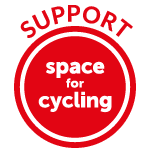 ASLs are really cycling infrastructure for the so-called fit and brave riders who make up a disproportionate amount of UK cycling, giving them another two or three cars advantage. If all ASLs were deleted, I don’t think I would mourn any that I know. It’s actually very similar to mine. In fact I’d add an extra branch for whether I’m turning right at the junction or soon after. I certainly don’t want to be merging with moving traffic. People who have just been sat at lights are unlikely to be paying attention to anything coming up alongside, and if they do see me are likely to resent the pushing-in and be aggressive. For best visibility I want to be in primary. That either means queuing in traffic or being in the ASL. Any option that leaves me between the two when the lights change leaves me vulnerable. “if they do see me are likely to resent the pushing-in and be aggressive” – are Cambridge drivers really that nasty? It’s not been my experience in Lynn or London, but I admit I only remember using an ASL in Cambridge on Hills Road because most of my routes don’t have them. I’ve not had problems with them inciting road rage on Hills Road, but I think those won’t be there much longer because of the forthcoming rebuild. 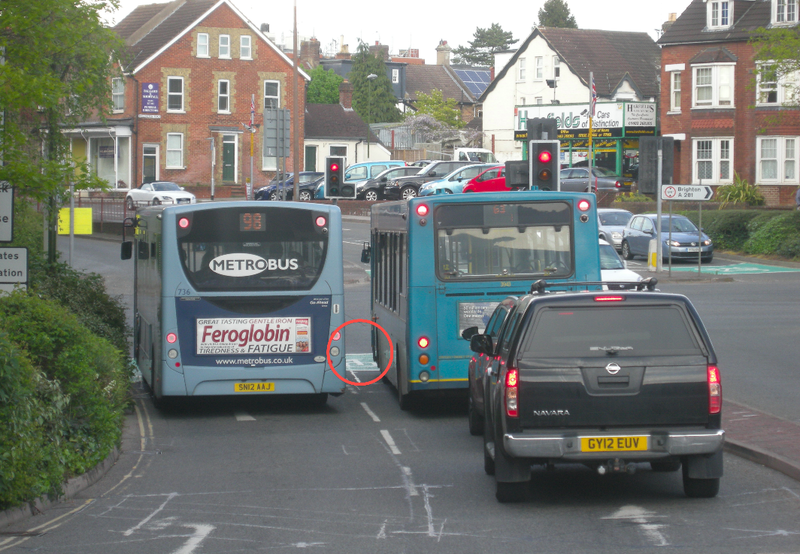 “People who have just been sat at lights are unlikely to be paying attention to anything coming up alongside” – Certainly, they are likely to be texting or on the phone, etc. From my own experience I think its realistic to move away now from ASL’s on large arterial roads of the type pictured. For smaller junctions where the right solution is traffic reduction, and where you would struggle to fit a fully segregated set of signals I think we’ll continue to see ASL’s for a while to come. There is a section of public opinion that will fight to retain existing traffic signals and is sceptical of traffic reduction and speed reduction as an alternative. There is nothing Advanced about most ASLs – ‘Retarded Stop Line’ would be a better phrase, for all its negative connotations, as well as the fact that other vehicles are being held back and bikes continue to stop at what was the original line. This is partly why they often get blocked by queueing or slow moving traffic. A true ASL would place cyclists in the ‘pedestrian area’ ahead of the main lights and with their own advanced start lights – I’m still waiting to see how these will work out. Something similar is already present in large intersections of Danish cities. Sometimes, the cycle track becomes a combined bike lane/right-turn lane for motor vehicles and sometimes the stop line for the car lane and cycle track/lane are at the same location. But there are ones where the cycle track stop line is about 2-5 meters ahead. Depending on the junction, cyclists may also get a head start. These are also called ASL’s, though they are not bike boxes (they seemed to be used interchangeably a lot in various blogs). Not as good as Dutch junction designs, but certainly better than the kind of ASL’s mentioned in this article. . 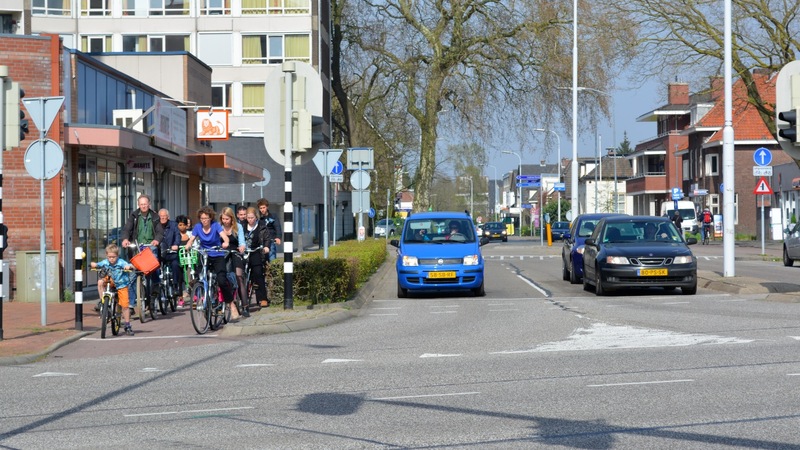 In The Netherlands, most cyclists ride to the front of the queue and even beyond the zebra crossing, the sooner to be on their way when the light turns green. No ASL needed, and motorists accept this behaviour. Devil’s advocate: I like to be able to filter past queuing traffic and sit at the front where I can make sure I am seen, and where I can hold my position until I know I will not be left-hooked; I then move aside to let other vehicles pass efficiently where there is plenty of space for both of us. If I filter and have to sit alongside the front vehicle, I am far more vulnerable. If I can’t or don’t filter motorists get frustrated that I hold them up when the queue starts to move and they are more likely to drive too close. ASLs make it legal for me to sit in front of the traffic at a red light. If there are lead-in lanes, they may even be left clear for filtering. From this point of view ASLs (particularly at single lane junctions) can be a real help to cyclists compared with no provision. They can even speed up overall traffic flow by reducing the time cars and bikes hold each other up. I agree that ASLs have real drawbacks: tempting the unwary up the inside when it is deadly dangerous, and encouraging cyclists to approach right turns from the left lane which is risky as the traffic lights can so easily turn and trap you in an awkward and dangerous place. Some ASL concepts are clearly ludicrous -why would you ever even consider approaching a right turn via the left of a 4-lane junction and then shuffle your bike across to the right? Of course I would rather see Dutch-style junctions, but I think the weight of campaigns should be FOR better solutions, not against ASLs per se. In some cases they do help make cycling faster and safer than if they weren’t there. It is cheap and easy for local authorities to ‘give cyclists what they want’ and paint over ASLs, but that’s not what the Dutch are doing -they are replacing them with something better. There’s nothing inherently wrong with using them, but they really have no place on a busy street. The British implementations clearly violate that standard. The contraptions pictured above can only be described as hideous and bordering on criminal. They should be immediately removed, that’s how bad they are. The contrast to the Dutch ones is amazing and infuriating when one considers how many people die under the wheels of a truck due to these facilities. 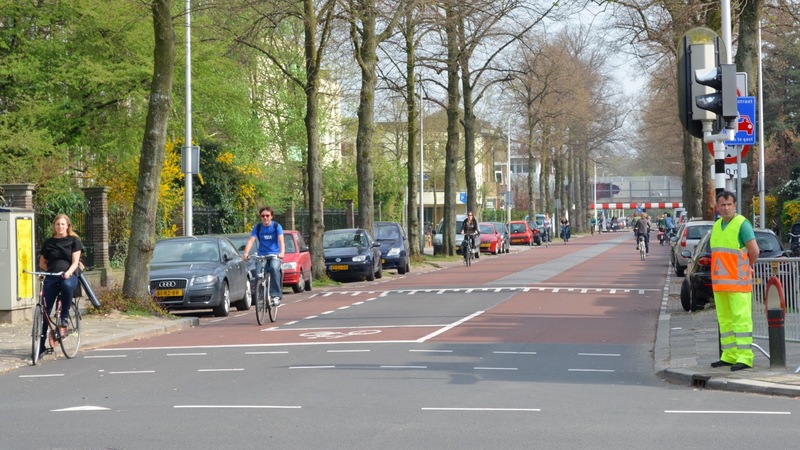 As seen in your pictures, the Dutch versions only show up on roads where at least a bike lane is already present which would be of enviable width on British roads. Of course, the “need” for them in the first place is greatly curtailed by the relatively low number of signalized junctions and efforts to separate bike routes from car routes. As far as I know no cyclists have died underneath the wheels of an HGV as a result of an ASL. The far from rigorous study into cyclist fatalities Mark links to doesn’t come to that conclusion. There has been one death since the study where the removal of the ASL was a likely factor in a cyclist’s death (Daniel Harris). Calls for their removal are mis-guided. About 10 years ago TfL transport engineers were instructed to put ASLs on every new or renovated signalised junction, or else write an exception report. Those exception reports would make interesting reading, I bet none of them said “we have made the junction so safe that an ASL is not needed”. ASLs were promoted after the Coroner investigating the death of a cyclist at Penton St junction with Pentonville road. The Coroner concluded that the cycle lane ending short of the junction had led the cyclist into a hazardous position. The resulting proliferation of ASLs is not associated with a rise in casualties or deaths, it is associated with a rise in cycling and fall in casualty rates. There is no evidence that they make the roads safer, nor do they make roads more dangerous. 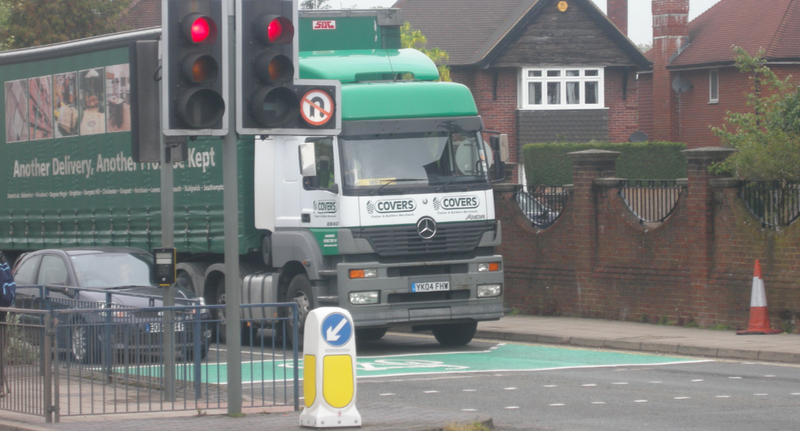 The supposed correlation between the ASL shape and a lorry driver’s blindspot is demonstably false. The bloggers like Magnatron who perpetrate that myth really should be taken to account. His advice on approaching junctions applies whether or not an ASL is present, as does the Loughborough/UCL study advice. Har Davids (above) says that Dutch cyclists ride to the front of junction and go in front even where there is no ASL, London cyclists are prosecuted if they do the same. Putting the ASL at the end of bike street as shown in the photo makes a lot of sense, the other Dutch junction shown may have a strong left turn desire line for cyclists, in that case an ASL fits with Dutch guidance. The appearance of ASLs all over the plans for Deptford is indicative of low quality ‘old skool’ design methods. It does not lead to a conclusion that ASLs should be removed from the junctions where they already exist and facilitate cyclists’ passage. There is an interesting conundrum of how should we comment on plans for new segregated traffic schemes where the capacity of the cycle facilities is likely to be too low for the number of people on bikes, other cyclists will likely use the roadway. At the Elephant, Queens Circus Battersea or Old st should these cyclists be given the advantage of ASL space? 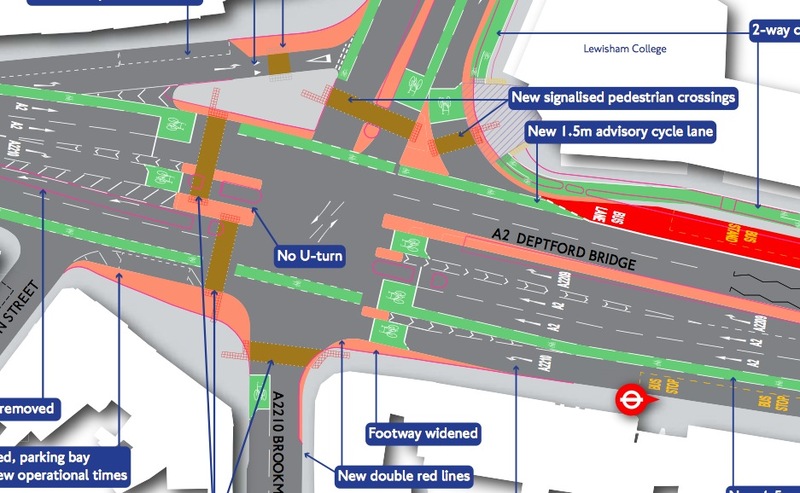 That Deptford plan is awful for cyclists. As the OP says: there’s lots of green paint but no benefit for cyclists. I ride that junction north/south twice a day. Going north there’s a pointless ASL that you can only get to by chancing life and limb and riding on the wrong side of the road with the risk that oncoming vehicles will suddenly appear. The plan is worse from the north. There’s two safe ways to get into the right-hand lane that allows you to go straightahead. If you’re super-confident you pop out of the mini-roundabout at the north and immediately move to the right-hand lane and take primary, usually with a fair lick of speed to offset car drivers’ annoyance at your presence, and to minimize the risk there’ll seek to squeeze past. Alternatively, you can ride down the left-hand lane and then stop and cross the lane to get to the right-hand lane. Which can be done quite easily if both lights are red. The plans advocate the worst solution: moving across the two lanes in the middle of cars’ acceleration zone. This is very dangerous. In reality it’s likely that both cars and bikes will just ignore that advisory lane. And don’t get me started on the waste-of-time two-way track to nowhere. It’s ignored now as it just puts cyclists into conflict with pedestrians, and doesn’t lead to anywhere. Another excellent post. Thank you, it is much appreciated. I always position myself centrally in the lane at lights if I can, but will only use an ASB if (a) there’s no traffic ahead of me anyway or (b) I don’t have a safe chance to get to the middle of the lane otherwise. (Admittedly they can be quite helpful in the latter situation.) As I’m taking the lane anyway I don’t really see what I have to gain from some magic box and it isn’t generally worth scooting along the kerb avoiding wing mirrors and running the risk I won’t actually get into a safe position before the lights change. But most other cyclists in my experience do use ASLs when they’re provided. This can lead to another problem – with multiple cyclists in the box it can become much harder to judge what to do when the lights turn green again in a safe/sensible way. I am in agreement with Magnatoms flow chart. It makes a lot of sense, why filter if there is nothing to gain and increase your own risk by doing so. I also think that it would be worth doing a study of putting the ASL further back to give a safe space for cyclists to filter to that does not put them in danger of left turning vehicles. It would somewhat reduce Magnatoms flow chart decision making process and allow cyclists to get into prime. Vehicles also pull away more slowly and predictably futher back as they have to allow gaps to build between each car and in a queue drivers are more likely to be patient as they don’t see a clear road ahead of the cyclist to get too!